A tide with numerous amounts of sea coal, always a ready winter fuel for residents during the cold winter months. 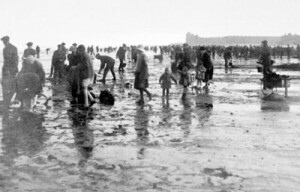 A popular ‘occupation’ in its day, and many a man, woman, and child could be seen as the tide went out begin to collect the sea coal from the beach. Free to anyone who collected it, the minute pieces of coal were spread all along the South Gare/Redcar/Marske/Saltburn coastline. Sometimes on good days when currents and tides prevailed the shoreline would be covered in coal. The coal waste was taken directly from the pitheads in County Durham (Easington) by conveyor belts, and eventually onto waste buckets out to sea. As the full waste bucket travelling along a pulley line (on pylons) reached its destination out at sea, the bucket before its return journey would flip over emptying the contents into the sea. People would work hard gathering the coal in sacks, barrows, wooden boxes full of the coal, leaving the containers along the sands as they worked. They knew exactly the turn of the tides, and that was the warning to collect their gains and remove them to safety above the water line. The coal would make a grand fire on a winters evening keeping out the chilly winds. Two, sometimes three of these sacks would be placed on a pedal cycle, and pushed home. The coal was dried out, and then the ‘Radio Times’ (better paper) pages would be made into cones, whereupon the sea coal was placed in them. The cone was then fastened at the top to prevent spillage. They burnt for hours. One drawback? Sometimes if the coal had come from where the charge (Dynamite) had been placed in the mine, very small particles of the explosive could get mixed in with the sea coal causing quite a stir in some houses at time, suddenly and without warning making a sharp retort. Following rough seas take a walk along the beach, and you will surely come across sea coal. The heavy seas on Monday washed up tons of sea coal on the Redcar beach, to the West of the Pier, and crowds of Redcar people, seizing the opportunity which is only granted them two or three times a year, hurried to the scene with baskets, bags, perambulators, carts and bicycles. The harvest was a big one and the fine spell on Monday morning allowed a constant crowd of sea coal gatherers to work from early morning until dusk. Many people made five or six trips, and one part came as far as Grangetown to get the coal. Sea coal if burnt in the proper way makes an excellent fuel. At Seaton Carew the harvest is more regular and the residents are always busy filling their cellars. This week’s coal harvest was the largest Redcar has known for many a month. It is a very rare occurrence for the coal to be washed up near the pier – it generally appears much lower down to the west. It is thought that the rocks at this particular point refuse passage to the coal. When the coal has been safely delivered to the Redcar cellars the young members of the household have a busy time making tight papers parcels of the material, and after these have been allowed to dry and set hard an excellent heat-giving burning fuel results. Best results from sea coal are obtained in the houses where special fires have been fitted which give an added draught to the fire grate. Residents of the olden day Redcar made these fires themselves by pushing a long piece of piping through the back of the fire grate and allowing it to protrude into the street. In the old Fishermen’s Cottages in Redcar many of these protruding fires are still to be seen. A Redcar official told the “Standard” this week that the principle of the sea coal as fuel could be applied just as successfully to household rubbish. He explained that at his home he made a point og saving all the refuse such as potato peels etc., and all this was made into the same tightly packed parcels. After these parcels were dried they burnt well and gave out as much heat as coal. “I burn everything but tin cans,” he said. The origin of the sea coal is uncertain. Some Redcar folk claim that if it an essence from the rocks, but the most feasible explanation is that it comes from ships waste. If a stoker throws out a bucket of ashes there is bound to be bits of good coal amongst it. The coke and ashes will float whereas the coal will sink and accumulate, and with the heavy seas be washed ashore. Though men folk were to be seen gathering the coal this week it is surprising how the heavy dirty job attracts the Redcar women. Many mothers and daughters had a busy and strenuous day on Monday and the large crowd showed that this ancient custom is still popular in Redcar. A sea coal harvest means a period of depression for the professional beach-combers who still exist in Redcar, for the large crowds who hurry down to the sands rob the winters beach of its customary privacy. Reprinted from the “Standard” 10 years ago this week (1935) this letter. The generally accepted reasons for sea coal are waste from steamships and deposits from works.